Forty-five years ago, two elderly women in the church where I worked in Berkeley, California, paid me to type their father’s journal entries so that they could print copies and share his stories with their younger relatives. As I typed, I was surprised to learn their father hadn’t planned to remain in America. He came to California from Sweden, intending to make his fortune and then return. When it took longer than he had expected, he traveled back to Sweden to marry and then brought his new wife to America. Still he hoped they would return to Sweden. But in the end, they remained here. Thirty-five years ago, I married a man whose parents immigrated to Canada when he was three years old. His grandparents had moved to Canada in 1927 when their oldest child, my former husband’s father, was three years old. They had left him behind in Yugoslavia with his grandparents because they only planned to remain in Canada long enough to make their fortune and then they would return. Timing was against them. The stock market crash, the depression, World War II, and the Communist takeover of Yugoslavia prevented them from both making that fortune and returning. Instead, in the 1950s they sponsored their now married son, his wife, and their three oldest children as immigrants to Canada. Thirty years ago, I worked as a consular officer in Stuttgart, Germany. Time and again I had to explain to a visa applicant that I could not issue a visitor visa because it was clear the applicant wished to work in the United States. For that, I explained, they needed immigrant visas. These applicants expressed universal surprise since they all said they had no plans to remain in the United States. They only wanted to work long enough to make their fortune and then return to Europe. This has always been the dominant immigrant story: the foreign-born generation comes to America to make their fortune. Most fail. But once there are children, there is no turning back. Even the first generation born in American often struggles without finding success. Recently I have heard a number of Americans who are two or three generations away from their immigrant ancestors explain that they want all today’s immigrants to follow the path they believe their ancestors followed: intentional assimilation into the American community. But they don’t know what they are talking about. They are too far removed from the experiences to know what their ancestors intended. That’s why it is important for those of us several generations away from our immigrant ancestors to read stories such as Vilhelm Moberg’s The Emigrants saga or O.E. Rolvaag’s trilogy ofGiants In The Earth, Peder Victorious, and Their Fathers’ God. We are too far removed from our ancestors’ experiences to realize not all immigrants of the nineteenth or early twentieth century shared the enthusiasm for assimilation the progency of their future generations now attribute to them, the same enthusiasm they now proclaim they expect all future immigrants to embrace. In most cases, only one adult in each couple was enthusiastic about the move. Most often, the husband. The women and children came along because they had no choice. The children were more likely to catch the assimilation bug, but not even all of them were destined to succeed. 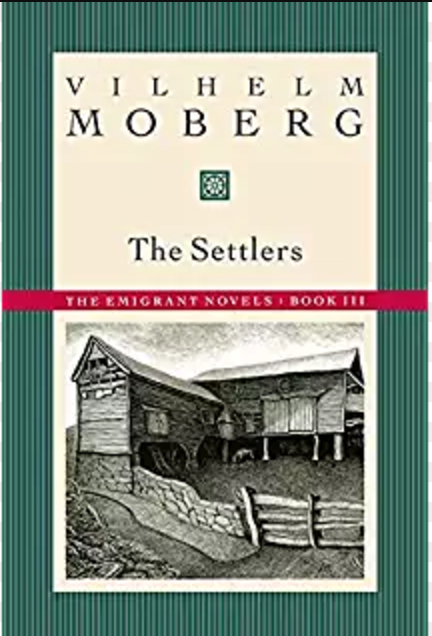 In The Settlers, the third in Moberg’s four-book series, he extends the story of the band of emigrants from Sweden in eastern Minnesota, focusing primarily on the family of Karl Oskar and Kristina Nilsson. We get glimpses of those who are likely to succeed in the new world. The pressure to remain connected among other Swedes weighs heavily on some, especially Kristina. The vision and promise of quick wealth in the gold fields of California tempt others. Those known as thieves and whores in the old world find blank slates in the new world, blank slates on which they can begin again. Later arrivals reveal the emigrants did not escape all forms of religious intolerance by leaving Sweden; some who left Sweden to escape the government’s strict religious boundaries brought equally inflexible strictures they were ready to impose on those in the new world. And while Karl Oskar continued to see promise in the new world, Kristina saw bleakness and separation. And the birth of more children did not bring a sense of renewal for Kristina; each child’s birth felt like the small death to Kristina. At the end of Unto A Good Land, the second volume of Moberg’s saga, Robert, Karl Oskar’s brother, along with his friend and fellow farmhand Arvid Pettersson, had left Minnesota to seek fortune in the gold fields of California. In The Settlers, Robert returns alone, his pockets now full of paper money but his heart still full of pride. The brothers each ponder whether the other might have chosen the wiser path, at least until Robert’s paper money turns out to be worthless. Karl Oskar remains convinced Robert will never stop lying, and Robert realizes he had let himself be tricked out of the fortune he had stumbled upon in spite of his never having reached California. This volume is not full of optimism, at least not on the surface. It depicts the weariness of the hard work those early emigrants spent for their children’s and their children’s children’s futures. Too few of us understand our family history. Nonetheless, optimism is the back story for this saga. We are the beneficiaries of our ancestors’ hard work and the separation from family they endured. My hope is that we will keep that in mind when we encounter the current group of immigrants, that we will recognize the separation and hard work they are willing to endure for the sake of their children, and that we will be tolerant of their attempts to retain their traditions, just as our ancestors did.